tech and start-up pitches: Introducing Disruptor for Keynote. *Now Updated with Disruptor2 Themes, JumpStart Templates & Expanded Mockups. Create a stir, cause a commotion, let them know you’ve arrived. Designed for start-ups, entrepreneurs and innovators of every stripe, Disruptor is ready to propel your pitch to the next level. The signature Slash Accent of the Disruptor theme is echoed in the embedded photo styles, turning your imagery into an integral, layered element of the slide with drag & drop ease. The Disruptor themes were conceived from the ground up as an assertive, modern pitch platform specially tailored for start-ups, entrepreneurs and innovators needing to boost their big ideas and create a lasting, memorable impression on customers and potential investors alike. Bold, modern type and eye-catching angles set the stage for a range of purposeful, use-driven layout styles designed to showcase your ideas with a unique, unforgettable flair. 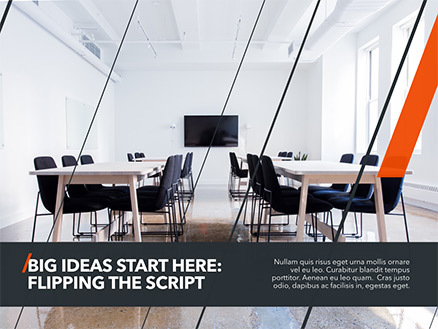 Built with the needs of tech start-ups in mind, the Disruptor themes includes a unique assortment of layouts designed to help you pitch your idea from every angle. Essential text and photo-narrative slides that tell your story and introduce your team balance data-centric highlight slides, along with a library of Mockup slides that allow you to visualize your concepts on desktop, tablet and phone interfaces with drag & drop ease. 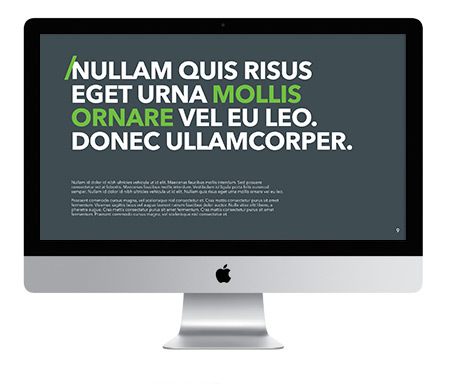 The resulting presentations are assertive, clean and balanced, especially well-suited for tech, engineering or high-impact modern corporate themes - with a range of detail-driven layouts and extras brought together in a style that's equally suitable for a wide variety of practical applications. The accompanying chart palettes are rendered in complimentary step/mono accenting tones, allowing you to pivot on mood, tone or contrast. And the entire Disruptor framework is optimized for everything the modern Keynote architecture offers, including a a full suite of color, chart and table styles that make it a snap to tailor each slide to your individual taste. Share Big Ideas, and Show Your Work. 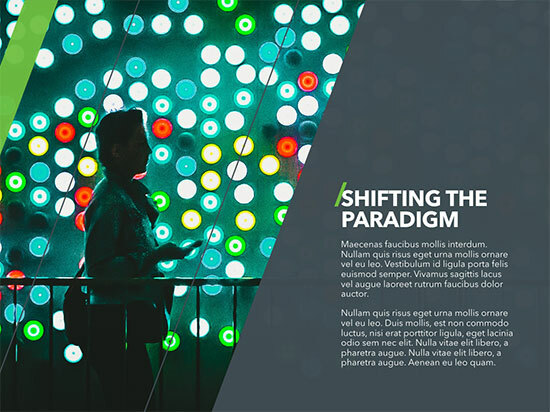 The Disruptor themes includes a range of eye-catching, narrative-driven photo layouts along with a full suite of Mockup Slides that allow you to showcase your concepts and designs in context. 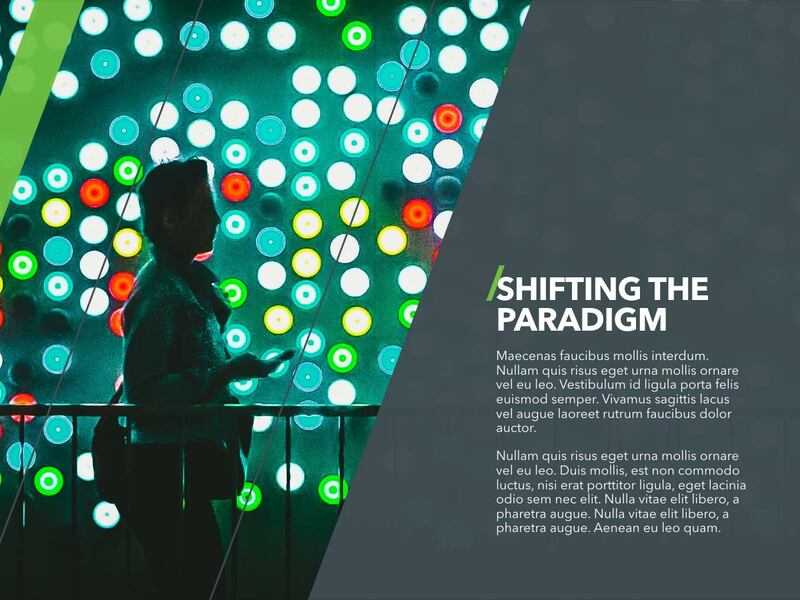 The Disruptor themes includes up to 88 master slides (HD edition) - a mix of editorial & image-driven layouts and mockup slides in the signature Disruptor style. Along with the basic content and photo layouts present in any Keynote 6.x-9.x theme, Disruptor also includes an expanded selection of general content-oriented masters, including Percentage Compare & Contrast, Quotations, Speaker and Agenda slides, Executive and Photo Welcome slides, and By the Numbers slides designed to highlight key data callouts. A full suite of Mockup Slides enables you to showcase your concepts and designs on a range of familiar Apple-centric hardware, including narrative and detail layouts featuring MacBooks, iPads and iPhones. The accompanying chart fills pop with a crisp, solid-color style – making your data eye-catching and legible from every angle – with Expanded/Mono variations built in to allow you to pivot each chart for contrast or mood. Disruptor HD, available in the Pro Edition, expands the style into HD format with an aspect-optimized widescreen version of the Disruptor themes, so you can take advantage of the clean simplicity of an iMac, a Mac-driven Cinema Display, or an HD Monitor or Projector as target presentation platforms without the "dead space" associated with running traditional 4:3 presentations on an HD display. Whether attached to an HD display or projecting to an HD-equipped room, your presentation will take full advantage of every inch, custom-tailored to intelligently adapt the Disruptor aesthetic to the larger footprint of HD. Can't imagine leaving your favorite portable device out of your work-flow? 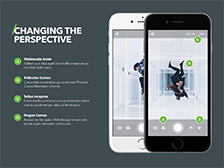 The Disruptor themes are fully compatible with Keynote for iOS and iCloud, so you can transfer a presentation using the Disruptor themes to your iPad, iPhone or iCloud Drive for playback or editing with no updates or special workarounds required. And Disruptor is also iOS Direct Install enabled, so you can install the Disruptor themes directly onto your mobile device from your KeynotePro Account to author new presentations on the go. Keynote for iOS is a beautiful way to engage your audience in a tactile way, and the Disruptor style remains just as stunning at arm's length as it is projected on the big screen. 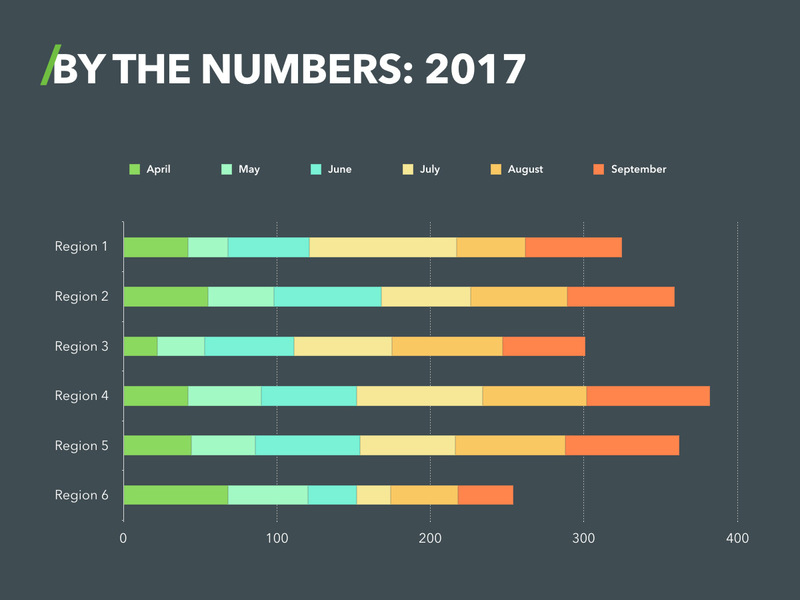 The Updated Disruptor themes now include Template Extensions to make your presentation building even easier. 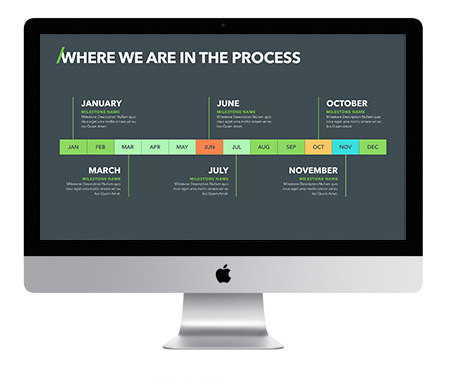 The Disruptor Elements: Timeline & Pricing Templates include Single and Multi-Slide Photo Timelines, Milestone Timelines, and Pricing Table slides ready to Copy & Paste into your Disruptor presentations. And the new JumpStart: Seed-Stage Pitch Template is designed to streamline the creation of a new Seed-Stage Startup Pitch to Investors - including a complete, structured presentation of pre-staged slides ready for you to customize to your own company or product. Tips and recommendations are built into each slide to help guide you during the creation of your own pitch, making it easier than ever to roll a new Disruptor-themed Startup Pitch right out of the box. 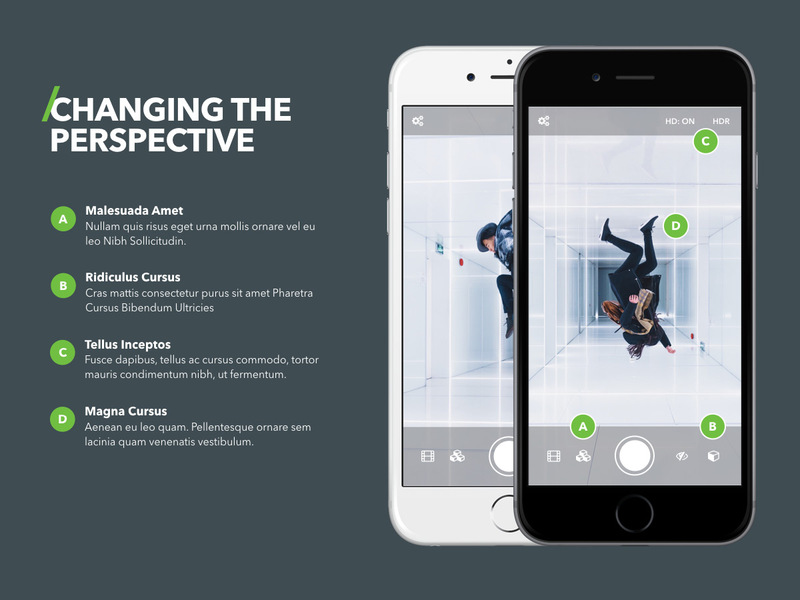 Keynote makes it a snap to create stunning, highly-stylized presentations with absolute ease. 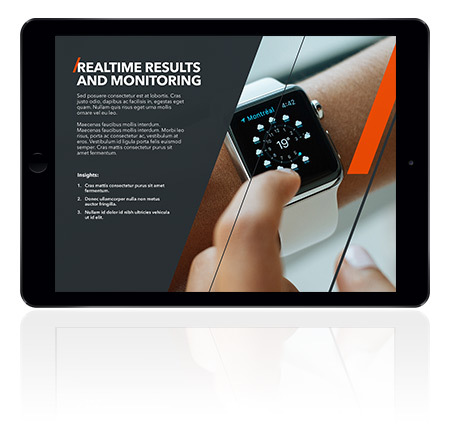 From the razor-sharp text and professional charting capabilities, to the wide range of native graphic format and alpha-channel support that give you unprecedented flexibility with your imagery, Keynote provides you with all the tools you need to present a detail-driven, assertive style with minimal effort. Keynote makes it a snap, and Disruptor wraps it all in a uniquely bold, contemporary style that's sure to help your big ideas stand out. 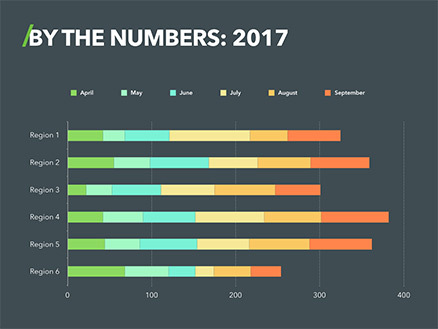 The Disruptor themes are fully optimized for the Chart Styles palette in Keynote 6.x-9.x, including a pair of Expanded/Mono palettes in each theme that allow you to pivot on mood or contrast. 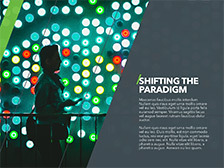 View the available Master Slides for the Disruptor Themes. Disruptor in Action. View a sample Disruptor presentation video. Requirements. Disruptor requires Keynote 6.0 or higher, and the Avenir Next font face. All photos shown for demonstration purposes only. iWork, Keynote, Mac, iMac, iPod, iPhone, iPad and the Apple logo are trademarked properties of Apple Inc.
Standard Definition (SD) Theme, Supplemental presentation containing Fills/Palettes, Interactive Objects, "Getting Started" guide. Standard Definition and Widescreen (SD/HD) Themes, Supplemental presentation containing Fills/Palettes,Interactive Objects, "Getting Started" guide. Disruptor (NXT) does not have a Pages Component.